The Swedish Helparm™ is a counter balance arm sling system which provides functional assistance with daily living tasks for patients with hand dexterity but little arm strength. The sling gives support to the patient's arms allowing the individual independence in eating, writing, etc. Sometimes called the Swedish Sling, the arm sling support system is used for re-educating muscles for patients with impairment or paresis of shoulder muscles, cervical spine injuries, should nerve injuries, hemiplegia, multiple sclerosis and certain forms of rheumatoid arthritis. 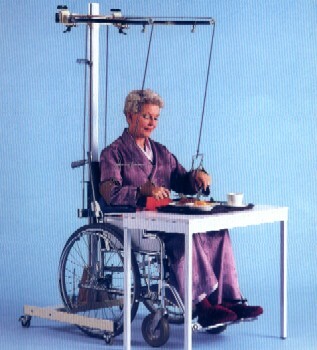 The Helparm can be used as an passive support for typing or computer use or more assistive use in re-training activities for daily living tasks such as eating, grooming, etc. The arm supports can be used independently. Adjustable weights provide multiple increments for correct assistance as well as resistance for deltoid muscles allowing and encouraging the patient to use what strength in those muscles they do possess. The Helparm provides proximal support to the shoulder for exercising and assists in functional reaching activities. The sling support cross bar can be adjusted to provide more distal support to the hand. 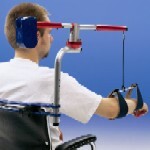 The arm support frame can be lowered for use with small adults or children. 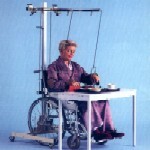 The Helparm can be used with a patient in a supine position, or with a patient in a wheelchair. Adjustable arms allow for internal and external shoulder rotation. The amount of swing can be restricted for elbow flexion and extension. The smooth gliding cord track allows the patient move his/her arms easily. Additional weights are conveniently stored on metal rods at the back of the base. The base has lockable casters. Dimensions assembled: 32" W x 30" D x 72" H.
Additional slings are available in packs of seven. Replacement plastic adjustment tabs and replacement nylon cord are also available. Cllick on the image to view more information on the Mobility Arm.